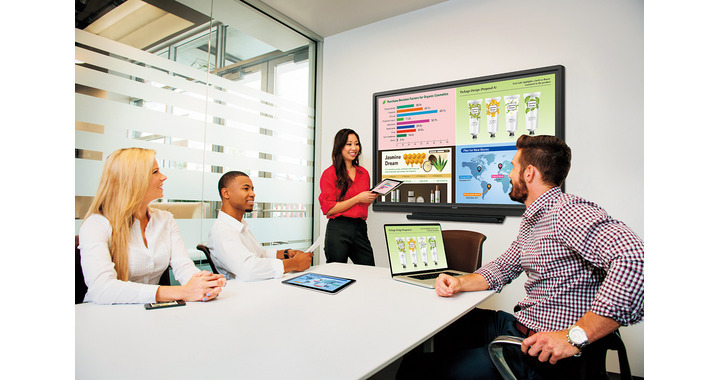 Our intuitive, class leading, interactive whiteboard display is what every meeting room and huddle space needs. 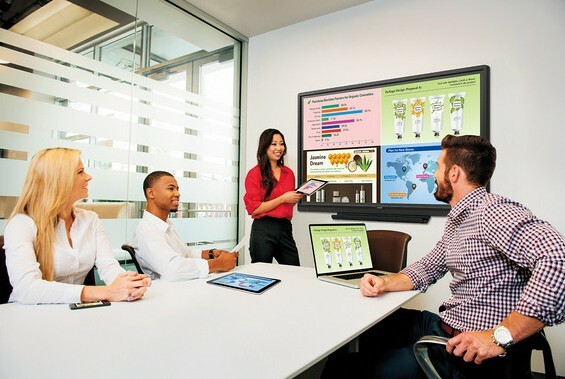 Imagine turning up to a meeting and being able to wirelessly connect to a electronic interactive whiteboard, no matter what device you are using, be it a Windows or Mac laptop, iOS or Android tablet or phone and deliver your message within minutes. 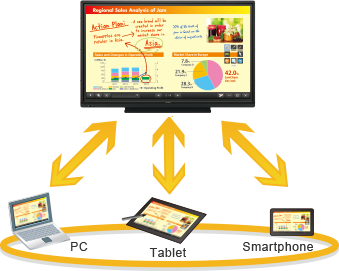 Take this a step further, 9 more of the attendees in the meeting also connect to the display, wirelessly, with up to any four of them being able to present on screen at the same using the split screen function. Well now there is no need to imagine, call us to see how our very easy to use wireless electronic whiteboards can help reduce wasted time and increase productivity, right from the start of the meeting. Use either a pen or a finger to touch the interactive electronic whiteboard and annotate, draw, make changes to spreadsheets, access your network resources and much more. All without connecting a single wire from any device. The wireless digital whiteboards are truly amazing devices and mean your organisation can benefit all BYOD users by ensuring they can connect, annotate, present and receive the latest version of amended notes with minimal effort. Participants can take an active part in meetings, brainstorming sessions, classroom interactions, and more. Once the meeting is drawing to a close, the modified content can be quickly saved to either a device or USB memory stick and distributed electronically. From switching the whiteboard on to being read to connect to it typically takes less time than making your coffee. This means you are ready to present, collaborate and be productive almost from the minute you step in the room. Using interactive whiteboards with built in wireless connectivity means you spend less time looking for the right cable to connect your laptop, smartphone or tablet PC. It also allows you to connect Windows, Apple and Android devices simultaneously without issues. Simultaneous Writing recognises up to 10 points of contact, the multi-touch Digital Whiteboards allow up to four people to write on the screen at the same time using touch pens or fingers. Discussions and presentations become platforms for effective and lively exchanges of opinions. Pressing the Digital Whiteboard touch button instantly displays an onscreen menu that lets you easily switch input sources, change volume level, or turn the touchscreen function on and off without using a remote controller. All the functions are easily accessible from the touch menu with large intuitive icons. The Interactive whiteboards are available in a number of sizes with the 60″ and 70″ being the most popular. The features remain the same irrelevant of size. the 60″ is ideal for huddle spaces and small meeting rooms whilst the 70″ gives real impact to presentations in larger areas including boardrooms.